This April 7 and 8, mark your calendar! The Philippine Association of Chemistry Students, Inc. brings you the National Chemistry Students’ Congress 2018! 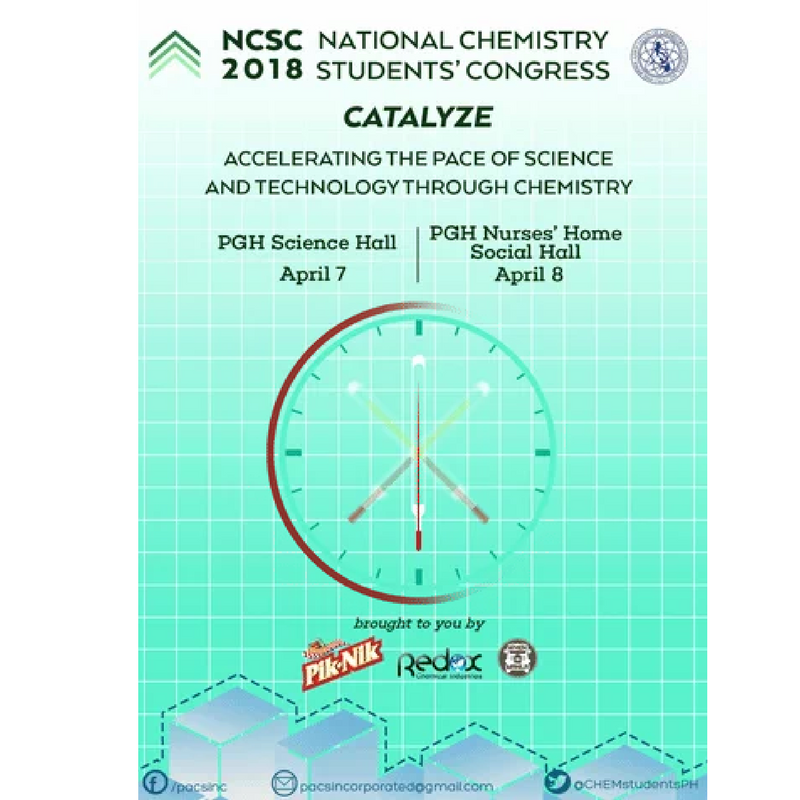 With the theme “Catalyze: Accelerating the Pace of Science and Technology through Chemistry,” this year’s NCSC (National Chemistry Students’ Congress 2018) aims to highlight the role of chemistry as a catalyst in the field of Science and Technology. From the discovery of fire to the discovery and use of certain processes such as nuclear reactions for the daily consumption of energy, indeed, Chemistry remains to be an indisputable driving force in the advancement of science and technology. We are proud to be part of this event together with PikNik and WhenInManila.com. The event will have different competition as follows. Please read the mechanics carefully before proceeding with the registration. For more information, kindly contact Yra Mae Camacho (09154760880), Ma. Ave Sanchez (09293147956), or Haggai Nidar (09976934069).